Founder/Consultant: Fabienne Lawrence received an MA in Clinical Psychology from Azusa Pacific University. However, her passion and love for the well being of animals took her down a different path. She turned her focus toward educating herself all about animals. Time, research, commitment, and study turned Fabienne into an amazing library of knowledge and a mentor that you can trust with a title DvetHom (Diploma in Veterinary Homeopathy). Fabienne holds a certificate from Penn Foster in Natural Care for Pets, along with a certificate from the California Paw Grooming School in All Breeds Pet Grooming. Fabienne also hold a certificate in The Science of Skin Learning Series. 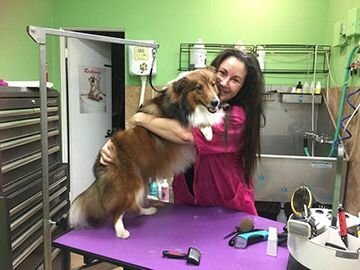 Fabienne is a member of Member of the California Professional Pet Grooming Association and the National Cat Groomers Institute of America. In addition, she's completed PetTech training for Pet Saver/Pet CPR & First Aid. Fabienne is a member of Member of the California Professional Pet Grooming Association and the National Cat Groomers Institute of America. Holistic Pets Center’s mission is to educate the consumer, to help them feel confident about the decisions they are making as Pet Guardians and provide just the right solutions. Provides homeopathic aid in support of the temporary relief of loose and watery stool. Wound Aid For Open Wounds - is hemostatic, strongly antimicrobial, analgesic, anti-inflammatory and a cell proliferator. This product is an emulsion of the extract of burdock root, echinacea root and yarrow herb in olive oil and beeswax. It is applied topically as needed. Whole leaf Aloe vera gel and Tea tree oil are put into solution with a benign surfactant. Halshan Raw Pet Food Is Non-HPP! Halshan Premium Raw Food manufactures raw food for dogs and cats. We use only natural ingredients no GMO in are veggies Meats are sourced from U.S.A Halshan uses only ingredients that are in the human food stream. Milk thistle is the subject botanical of wonder drug status, it enjoys a rich history dating back millennia. The Roman Pliny the Elder wrote of milk thistle s virtues. Chasteberry is effective in treating endocrine abnormalities such as Cushings disease and dermatosis. Chasteberry is estrogen active and has a pronounced effect on hormone balance. It comtains hormone likea substances that bind receptors and is therefore used in progesterone imbalance situations. Chasteberry is a well-known herb that has been used for centuries in Europe for hormonal imbalances in women. In animal studies, chasteberry has been reported to diminish release of follicle-stimulating hormone from the anterior pituitary while increasing the release of luteinizing hormone and prolactin. It also contains constituents that bind to dopamine (d1 and d2) receptors and seem to inhibit prolactin release. What is Cushing's disease? Cushing's disease results from an excess of adrenal gland hormones. It is a common side-effect of drugs like Prednisone, which is often prescribed to treat dog arthritis, allergies and other ailments. Cushing's disease can also result from a benign tumor on one of the adrenal glands or the pituitary gland. Symptoms of Cushing's disease include: Increased thirst and appetite Frequent urination Loss of hair Skin problems Panting High blood pressure Increased susceptibility to infections If left untreated, Cushing's disease can lead to even worse conditions like diabetes and heart problems. Hydro-Massage Ozone Therapy Machine for pets. Using the Ozone Machine during a therapy will increase the healing time by more than 10 times than just therapy alone. By using our therapy products and the ozone machine, you can get results that medications alone can’t do. Product Narrative, T. S. Fox, Ph.D. Uva Ursi is a diuretic, antimicrobial and has found wide anecdotal efficacy in controlling involuntary bladder voiding. Dosage is one cc per 50 lb. weight up to three times daily. Use eight cc three times daily for large herbivores. Large dosages may result in nausea, vomiting and collapse. Avoid use during pregnancy and lactation. Aconite is used to treat fear, anxiety, and restlessness; acute sudden fever; symptoms from exposure to dry, cold weather or very hot weather; tingling, coldness, and numbness; influenza or colds with congestion; and heavy, pulsating headaches. Orphaned Puppies - Aconite 30c. 30c for orphaned puppies- difficult birth process, puppy is cold and slow to start moving, breathing shallow. For symptoms after great fears, stresses, chills, or sudden and dramatic changes in weather. Dramatic display of symptoms after these situations. Great anxiety and fear in the patient, that “deer in the head lights” look. Very acute symptoms often before physical or pathological changes occur. Sudden onset fever with a thirsty patient, abortions, founder, colic, convulsions, and pneumonia. Insect Bites - Bees, Fleas, Wasps For itching, stinging, swelling of the face, lips and eyelids. 1 dose as needed until improvement. Anaphylactic shock: Dose every 15-30 minutes until improvement then only as needed. For tissues that are edematous, red, hot and extremely painful. Hives. Aesculus hippocastanum is a homeopathic medicine that helps with hemorrhoids. 30c or 200c. A pet in an arsenicum state will display great restlessness, extreme fatigue and severe anxiety. It is the number one food poisoning remedy. This remedy relieves diarrhea and vomiting from eating bad food. Give pallets twice an hour for a few hours. Good for general pain, stiffness due to overexertion, soreness and musculoskeletal injuries. For eye injuries: 200c or 30c for blunt trauma to the eyeball and bleeding behind the eye. Bruises & hematoma - 200c or 30c. Heals bruises and absorbs blood under the skin. For the affects of trauma of any sort. Bruising, bleeding, traumatic swellings, post parturient trauma – especially where the patient is standoffish and doesn’t want help. Pains after delivery. Symptom complexes characterized by sudden and high fevers, redness, pain, thirstlessness, dilated pupils and panting. Great remedy for small children with bright red, painful ears who wake up screaming in pain. Also a good remedy for migraine headaches when there is extreme sensitivity to light and noise. Heatstroke. Any condition with red, burning, dry mucous membranes or tissues. Red eruptions on the skin with high fevers. Symptom complexes characterized by sudden and high fevers, redness, pain, thriftlessness, dilated pupils and panting. Great remedy for small children with bright red, painful ears who wake up screaming in pain. Also a good remedy for migraine headaches when there is extreme sensitivity to light and noise. Heatstroke. Any condition with red, burning, dry mucous membranes or tissues. Red eruptions on the skin with high fevers. Excellent for fear of thunderstorms and fireworks. Give this at the 6c potency twice a day for a month during the season. Berberine is a recognized antibacterial agent and has been shown to kill amoebae in test tube studies. It also prevents bacteria from attaching to cell walls, reduces inflammation and strengthens immune functioning, thereby warding off infection and acting as a preventative as well as a natural antibiotic. Berberis also helps to treat the symptoms of diarrhea, especially if related to E.Coli infection. Arthritis - Hip Dysplasia: Any condition worse from any movement. Pleurisy and pneumonia when even the movement of breathing is painful. Calcarea carbonica (middle layer of the oyster shell) Calc carb has a lot of indications for orthopedic cases, especially chronic ones. It's not really a remedy for acute cases or injuries. ... General inflammation of the joints, such as chronic spinal arthritis or spondylosis. Calendula – use for skin infections or any kind of external infection. Well indicated for jagged, ragged, extremely painful cuts and abrasions. Primarily a remedy for blistered burns but also indicated in cystitis where there is a burning and urging to urinate. Also indicated in conditions where there is a concomitant of burning and urging in the bladder. Cystitis - Urinary Tract Infection - For bladder infection with burning pain before, during and even after urination. Primarily a remedy for blistered burns but also indicated in cystitis where there is a burning and urging to urinate. Also indicated in conditions where there is a concomitant of burning and urging in the bladder. Historically used for malarial or remittent fevers. On the farm it is a useful remedy when the patient is collapsed from the loss of bodily fluids (Dehydration - Loss of Fluid) diarrhea, vomiting, bleeding, lactation, etc. Also for bloating colics not relieved by the passing of gas. Roundworms - 200c. Can be given to puppies to get rid of round worms. It is highly effective for killing and expelling worms, especially roundworms. Historically used for malarial or remittent fevers. On the farm it is a useful remedy when the patient is collapsed from the loss of bodily fluids–diarrhea, vomiting, bleeding, lactation, etc. Also for bloating colics not relieved by the passing of gas. Despite serious safety concerns, hemlock leaves, root, and seeds are used to make medicine. It is used for breathing problems including bronchitis, whooping cough, and asthma; and for painful conditions including teething in children, swollen and painful joints, and cramps. Hemlock is also used for anxiety and mania. Cramping colics that bend the patient double. Relief is felt if bent double or if hard pressure is applied. For bloating and conditions of trapped gas in the intestinal tract. Colics, volvulus and gastric torsions where there is bloating. Sudden collapse, near death, with pale and/or blue mucous membranes. Dose using the acute emergencies method. Quit dosing as soon as the animal improves. For bloating and conditions of trapped gas in the intestinal tract. Colics, volvulus and gastric torsions where there is bloating. Collapse, near death, with pale and/or blue mucous membranes. Found in blood plasma, blood corpuscles, bones, teeth, connective tissue, saliva and digestive juices. Potential uses: treatment of blood disorders, thyroid problems, cysts, teeth and bone disorders, and digestive disturbances. Urinary Bladder Stones - dry dosed once weekly for 6-8 weeks. For prevention, 1 pill given as dry dose twice a month may help prevent or reduce occurrence of this condition. For those runts and stunted infants that won’t grow. Severe nausea with vertigo. Motion sickness. Carsickness with nausea and vomiting. An excellent Way to Control Tartar Buildup on Your Pet's Teeth. Give dry - 1 pill twice a month to help prevent tartar build-up. Very sudden onset of deep respiratory symptoms, maybe with suffocation caused by bleeding into the lung. Performance anxiety. An excellent remedy to give for any pain due to nerve damage or injuries to nerve-rich areas. Used for painful puncture bites with nerve pain. an excellent remedy to give for any pain due to nerve damage or injuries to nerve-rich areas. I once closed my finger in a window and learned firsthand the wonders of Hypericum. Great for when you cut your dog’s toenails too short. This was one of Hahnemann’s premier remedies. It finds application for any condition, especially of the skin, with exquisite sensitiveness, cannot bear even the slightest touch. Tendency to abscess, very painful abscesses or developing abscesses. Hepar sulph is a great remedy for painful inflammatory conditions such as abscesses and other skin infections, gum infections, and ear infections. Dogs who need this homeopathic remedy are in such pain that they will cry, growl, snap or try to hide if the affected area is touched. Ear Infection - Infection with or without discharge - yellow free-flowing pus. Ipecacuanha is a remedy with two distinct indications. First is its use in nausea and vomiting, especially if the vomit is clear mucous like egg whites. Patient vomits then has the urge to vomit again. Profuse salivation can accompany nausea. The second indication for Ipecac is in bleeding tendencies where it may look similar to Phosphorus – bright red blood from any or every orifice. Especially if accompanied with nausea, vomiting, or diarrhea. Used to induce vomiting for dogs and cats. Once you have seen the snot of a Kali bichromicum patient you will never forget it. The respiratory symptoms of a Kali bichromicum patient are characterized by a thick, ropy, elastic, rubbery yellow to green mucous that can form a streamer nearly a foot long from the nose. Other discharges tend to have the same character whether it is a vaginal discharge or mastitis milk. This remedy has the reputation of being the remedy for bite wounds or insect stings, especially when the affected area is cold and is made better by cold applications. The same holds true for puncture wounds. Historically Ledum has proven effective in preventing or stopping tetanus after puncture wounds. Currently it is used by many homeopaths to treat Lyme disease. Consider for Enhancing Behavior Modification Training Typical patient has symptoms that tend to move from one part of the body to another. The patient dislikes being alone and appears apprehensive; is alternatively aggressive and submissive. Consider for Enhancing Behavior Modification Training Typical patient has symptoms that tend to move from one part of the body to another. The patient dislikes being alone and appears apprehensive; is alternatively aggressive and submissive. Melamine poisoning: If used early enough it can help to limit the damage to both the liver and the kidney. If after giving Lycopodium there is kidney damage, think about Apocynum 200c. Frequent urination, especially at night. Extreme straining, either for diarrhea or urine. Bloody urine. Frequent urination, especially at night. Sarsaparilla is used for treating psoriasis and other skin diseases, rheumatoid arthritis (RA), and kidney disease; for increasing urination to reduce fluid retention; and for increasing sweating. Herbs for pets from A-Z. Give your furry family members the absolute best care. At Holistic Pets Center, we know how difficult it can be to find a reliable groomer. Leaving your beloved pet in the hands of a stranger is often anxiety inducing. That's why we go the extra mile to ensure that your furry friends are treated like family. Bolster Your Pet's Health with Our Skin Therapy Find a solution to your pet's skin conditions. At Holistic Pets Center, we know how stressful it can be to have an uncomfortable pet. That's why we offer safe, comprehensive pet skin treatments. With the help of our therapeutic pet spa treatments, you can promote health, well-being, and relaxation. Make sure to promote your pet's health at home with our all-natural food, treats, and supplements. At Holistic Pets Center,we know that cats have specialized needs. That's why we offer a range of grooming services specifically for your feline friends. With our cat grooming service, we'll address any problem you're facing, including dandruff, allergies, hair balls, ingrown claws, shedding, grease, odor, and unsanitary conditions. Create long-lasting memories with your pet's image. At Holistic Pets Center, we truly believe that pets should be treated like family members. That's why we offer pet photography. Our photography services are available on Sundays and Mondays by appointment only. Pet Care Room Comfortable Drying & Overall Health Improvement Maintain a high standard of cleanliness & wellbeing in your companion pets!